Ruby Unconf Hamburg 2018 | Ruby Unconf 2018 takes place on the 5th and 6th of May 2018 in Hamburg, Germany. Thanks for an awesome event! 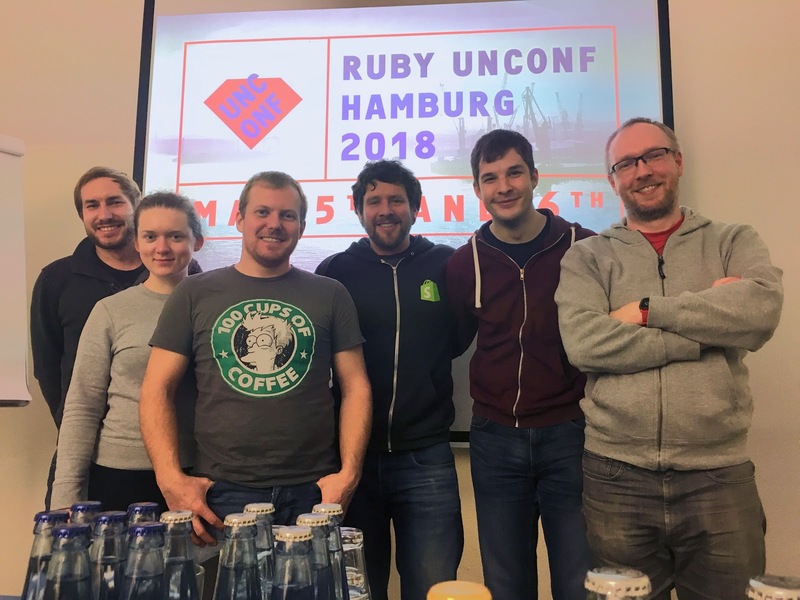 Ruby Unconf Hamburg 2018 happened on 5th and 6th of May 2018 at the HAW Hamburg, DMI Campus Finkenau. 200 participants, 20 talks, 8 lightning talks and 1 workshop, all given by community members. It was a blast to host such a nice conference. The recordings of the talks are available on Youtube: Ruby Unconf Youtube Channel and some photos can be found in this shared album: Ruby Unconf Photos. The heart of the Ruby Unconference is people. This guideline is meant to support a happy, productive and safe event experience that can welcome new ideas and inspiration for all attendees. Regardless of gender, sexual orientation, age, ability, ethnicity, socioeconomic status, and religion (or lack thereof). We gain strength from diversity, and actively seek participation from those who enhance it. Read the full Berlin Code of Conduct here. What exactly is an Unconference? It works like this: Everybody can propose a talk. Everybody votes for the talks they want to see. The most voted talks will be held. You decide what will happen! We’re hosted by the Hamburg University of Applied Sciences, Faculty of Design, Media and Information. The easiest way to get there is by walking 500m from the U-Bahn (Underground) station “Mundsburg”, which is about a 7 Minute ride away from the central station (“Hauptbahnhof”). It’s probably not a good idea to try to go by car, as parking space is very limited and even on a saturday, we can’t really recommend driving in Hamburgs inner city. If you are arriving from Hamburg Airport, you should take the S-Bahn (Metro) to Barmbek and then the U-Bahn to Mundsburg. The Venue is right next to the Eilbekkanal, a channel that runs directly to the Alster lake (“Aussenalster”) which is probably a 30 minute walk but especially worth it on a sunny spring day. Next to the train station “Mundsburg” is one of Hamburgs largest shopping malls which includes a cinema (if you don’t like partying on saturday night, for example) - Be warned though, all movies there are probably shown in german. Please contact our team at info@rubyunconf.eu if you have any questions, remarks or ideas. Header image by Jens Comiotto-Mayer used under CC BY / Modified / Thanks!